When it comes to siding, you have many materials to choose from. Whether your tastes run to warm, earth-toned finishes or a more vibrant, contemporary aesthetic; horizontal or vertical siding; wood, stucco or fiber cement, the siding you choose will certainly impact on the appearance of your home. More importantly, it will affect your home’s weather protection. Wood. Ever popular, wood is a traditional siding product that’s . eco-friendly and is easy to paint to suit your home’s character. Wood siding is typically made with highly sustainable resources like cedar — a notably fast-growing kind of tree. Wood siding is energy-efficient and takes less energy to manufacture than petroleum-based siding options. Want to reduce your environmental footprint? Wood would be the perfect choice for you. Stucco. Stucco is a fantastic insulator. It’s a cheap and easy way to maintain a constant temperature in your home, making it a popular siding choice in areas that experience extreme heat. Its smooth, traditional finish lends itself well to color tints, carved designs, mosaics and murals, making it one of the most creative and innovative siding applications on the market. James Hardie Fiber Cement. Featuring excellent damage resistance, a long lifespan and minimal maintenance requirements, James Hardie fiber-cement siding is a strong, thick material that holds up against windstorms, rain, hail, and other bad weather. It also resists insect damage, rot and fire. Partially composed of sand, this fiber cement product won’t warp, flake or peel either. LP SmartSide. Boasting excellent strength and durability, LP SmartSide siding can withstand harsh weather conditions such as humidity, extreme temperatures and rainfall. It’s also easy to install, as it’s light and unlikely to crack or break. LP SmartSide products can easily take screws and nails. This product comes in four distinct collections that are pre-primed at the factory to make it easier for you to apply the paint color of your choice. The product also comes from renewable and natural resources that can be easily replenished. For your roof replacement and siding replacement needs, turn to a trusted roofing and siding contractor like Buford Roofing and Construction Inc. Call us today at (817) 754-6555 to learn more about our products and services. 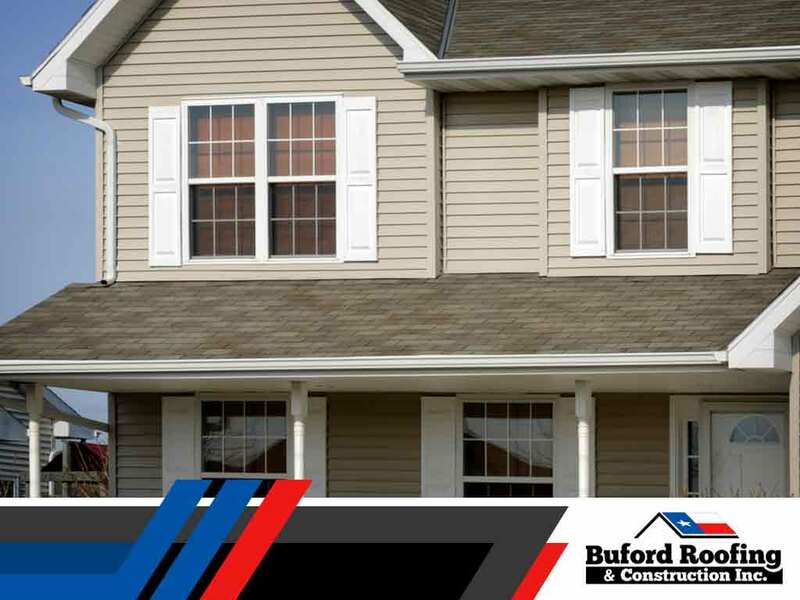 With Buford Roofing and Construction Inc., you can be confident that your siding installation will be performed by factory-trained professionals. We take pride in our excellent customer service, and we will always go to great lengths to guarantee your complete satisfaction. Fill out our contact form today to schedule a free, in-home consultation in Flower Mound and in Grapevine, TX.